What information is needed to make a reasonably precise agronomic recommendation for a small plot of land, or for an entire district or a state? Agronomists must collect and analyze a multitude of variables when formulating agronomic recommendations, including crop and soil types, biotic and abiotic stresses, weed and nutrient management practices, weather and available irrigation infrastructure. Moreover, agriculture is extremely dynamic and conditions can change rapidly – with each cropping season and from one farm to another, making the process of formulating agronomic recommendations a challenge. This is where a Geographic Information System, or GIS, comes into play. GIS is an applied science that analyzes information pooled from various sources at precision and landscape scales and enables evidence-based decision making. When used effectively, it can serve as a powerful, interactive tool that presents complex information in an actionable and simplified form, including as maps, graphs or reports. In combination with remote sensing, which involves the collection of information for a specific geographic area or object remotely – typically by satellite or aircraft – GIS can be used in diverse fields such as natural resource management, transportation and infrastructure planning. In agriculture, although GIS use is in a relatively nascent phase, it is increasingly being used as a basis for crop management and policy making. CSISA relies on GIS and remote sensing for crop monitoring, area identification and technology targeting. Further, CSISA employs these technologies to complement monitoring, learning and evaluation activities being conducted on the ground. For example, when selecting areas to be surveyed to evaluate the impact of CSISA’s interventions on timely sowing of wheat in Bihar, GIS and remote sensing were used to analyze sowing dates across targeted locations in the state and accordingly classified as early or late sown. This enabled CSISA to ensure the selected sample represented the actual ground conditions and minimized variability or bias in the results. CSISA is using geospatial technology to study in-field yield variability by using high-resolution satellite data, specifically targeting fertilizer application methods and their effect on crop yield. CSISA is also evaluating in-season adjustments of nitrogen and irrigation based on remote sensing data such as vegetation indices that show the relative density and health of vegetation and thermal band imagery that shows surface temperatures. It is important to note, however, that much like any other science, the accuracy of GIS-based approaches depends heavily on the quality of inputs provided. For instance, satellite data plays a big role in GIS analysis. CSISA uses MODIS (Moderate Resolution Imaging Spectroradiometer) satellite images to analyze wheat sowing dates instead of Landsat imagery. This is because Modis has a very high temporal resolution but relatively coarser spatial resolution, meaning the satellite passes over the same area every 8 days but captures limited detail (where 1 pixel = 250 meters x 250 meters). Landsat, on the other hand, captures greater detail (where 1 pixel = 30 meters x 30 meters) but only passes over an area once every 16 days. Other factors such as staff training, equipment quality, favorable weather for remote sensing, sampling plans with sufficient ‘ground truthing’ points, and availability of spatial and non-spatial information are all important to effectively utilize GIS application. Further, while freely available datasets may be adequate at the landscape level – since data at that scale is largely aggregated – to achieve precision at the farm level paid imagery is crucial. Other challenges are those that may be said to be true for the agricultural sector in general – limited sharing of data between agencies, as well as constraints associated with copyrights, internal policies, and limited budgets for purchasing images and equipment. GIS and remote sensing technologies have rapidly evolved, experiencing significant advancements in recent years. With the launch of micro satellites, for example, the tradeoffs between spatial and temporal aspects are reducing. Drones are facilitating a higher-level of precision in agricultural data by creating an opportunity for real-time monitoring. At the same time there has been unprecedented growth in open source platforms, which have made these technologies accessible even to small organizations. The United States Geological Survey, in fact, made Landsat images free to use for everyone – a major breakthrough in its own right. CSISA used MODIS satellite data from the last 14 years to evaluate the trend of wheat sowing in Bihar and eastern Uttar Pradesh. By using satellite images and vegetation indices to understand the growth curve of crops, CSISA generated an algorithm to derive sowing dates. The resultant wheat sowing map indicates that wheat is generally sown earlier in the central and northwestern parts of the study area. CSISA monitored field vacating dates after kharif harvesting using the same methodology. The resulting analysis helped CSISA identify which areas had the greatest potential for early sowing of wheat. This figure indicates that fields in the southwestern and north-central study area (the districts of Ara and Buxar) is usually harvested late and becomes available later for wheat sowing. These areas thus have the greatest potential for technologies that would enable early sowing. Monitoring also facilitated CSISA’s efforts to convince farmers to sow wheat early in Bihar and eastern Uttar Pradesh. The encircled areas mark those targeted by CSISA, where early sowing has now been adopted. 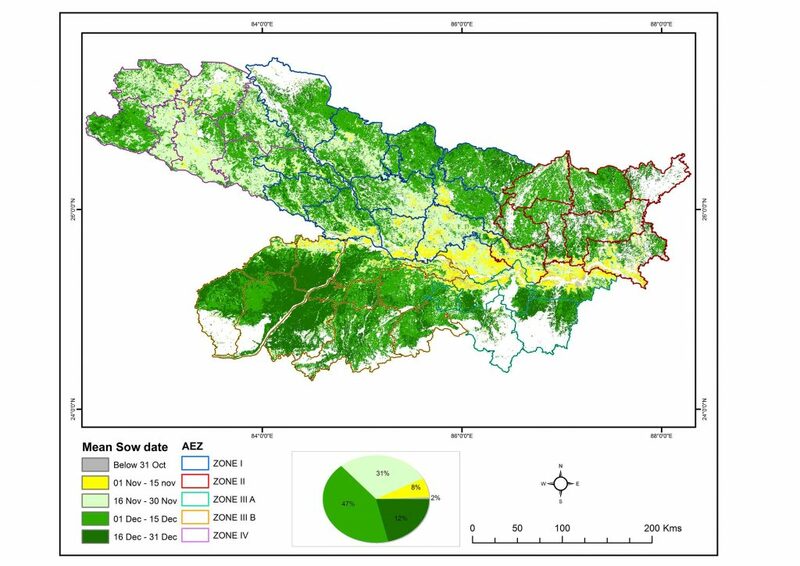 CSISA also used GIS to identify kharif fallows in Bihar and eastern Uttar Pradesh. CSISA used MODIS images followed by vegetation indices and rigorous ‘ground truthing’ to define a specific threshold, below which one could identify the non-cropped areas. This data was cross-checked with previous years’ data to evaluate whether or not these were permanently fallowed lands. This figure shows that while some fallows shifted across the year, those in south-central Bihar were relatively fallowed throughout, possibly due to insufficient irrigation or other associated factors. GIS and remote sensing also enabled CSISA to identify which areas in Bihar and eastern Uttar Pradesh had topographical limitations or other adverse characteristics that would undermine interventions on certain technologies. CSISA used digital elevation models, thermal bands and vegetation indices to generate a spatial model for identifying such areas. Analysis revealed that one of the challenges for early sowing of wheat in Bihar and eastern UP was the late drainage of water from rice fields. Farmers in these areas were opting for longer duration rice crops, meaning that early wheat sowing would not be feasible. The reason behind late drainage was primarily topographic. This figure depicts areas in the southwest that are usually drained late across years. These were identified as areas that were either low lying or where clay soils were responsible for water retention. In coastal Odisha, CSISA supports the dissemination of direct seeded rice (DSR) technology, which would not be successful in waterlogged areas. CSISA needed to identify coastal areas prone to flooding during the monsoon. An in-season time series analysis helped identify these areas. This figure shows that with the onset of the monsoon in July, the north central areas were most severely affected – especially between the last week of July and early August – and that the water receded only after the last week of August, thereby making it unsuitable for DSR. This article is authored by Amit Srivastava, GIS Specialist, CIMMYT.